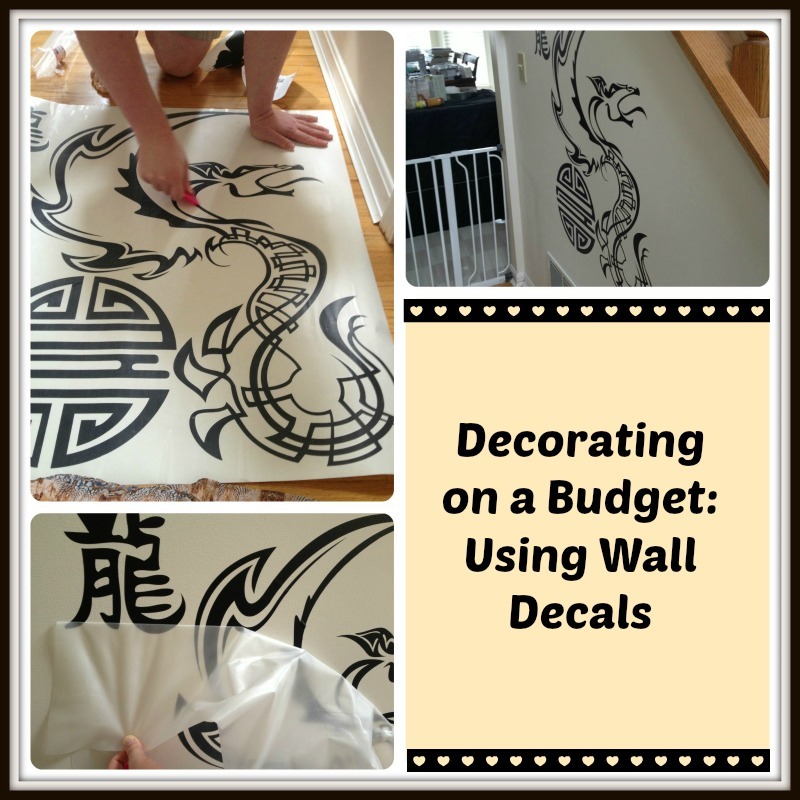 Have you ever considered decorating with wall decals? I hadn’t either, having only seen the cheap wall decals and children’s wall stickers that you normally find at Wal-Mart or Target. I thought to have a beautiful wall mural, I was going to have to buy stencils and do it myself. Don’t get me wrong, I love DIY projects and being creative, but I have a hard time finding the time. I have so many projects planned with our house, murals never were a priority, even if the ones I saw while looking on Pinterest seemed very cute. About the time I was starting to do research into wall decals, I was approached by “Dezign with a Z,” asking if I wanted to review one of their murals. Obviously, I was super excited (and my husband, ever the skeptic, worried about it looking good). Personally, I was ready for the challenge! Like many other houses in my subdivision, my house has a beautiful open staircase that goes to the second story on my house. 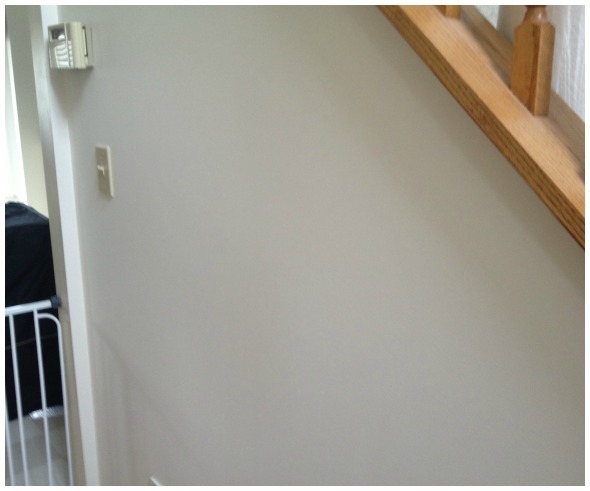 While I love the look of my staircase, I had no clue what to do with the small partial wall underneath the stairs. To make matters worse, this wall has an air return, our thermostat, and a light switch, making it a bit unbalanced . Everything we have tried putting on this wall looked terrible. Add to the matter that the wall really needed repainting,. My husband and I both agreed it needed something striking, making a large wall decal a possibility. Once I was asked to do the review, I started looking on Dezign with a Z for the perfect wall decal. Our house has a lot of fantasy and sci-fi artwork, so I had no clue where to even start looking. When I was looking for through the animal wall decals section, I found something I would never expect – dragons! Yes, you heard me, dragons – flying lizards with wings? What could be more perfect for our house? In less than a week, our mythical dragon wall decal arrived in the mail. I couldn’t wait to get it out of the tube and on our wall. The problem was, that our wall still looked terrible. While I dreaded doing it, it was time to get paint. Luckily, our local Porter Paint had paint on sale and I was able to get a gallon of Enduring Ice in a matte finish. To see our wall transformation, make sure to check out my pictures below. While I was a bit impatient to get started, my husband made me wait an extra day for the paint to dry (though I’ll admit we got lucky, Dezign with a Z recommends waiting two weeks to totally dry). Once we were certain it was dry and didn’t need touching up, we took out our brand new mythical dragon wall decal. To fit the space, we chose the 33″ x 35″ version. Having never put up a wall decal in my life, I had no clue what to expect when it came to actually place it on the wall. Lucky for me, my husband was there to assist while I took pictures! It is important that you follow the directions closely for applying your wall decal. Each wall decal from Dezign with a Z comes with a special tool used for rubbing the decal firmly into place. Below, I have pictures of our own experience putting up our wall decal. As you can see, it was surprisingly easy and painless. 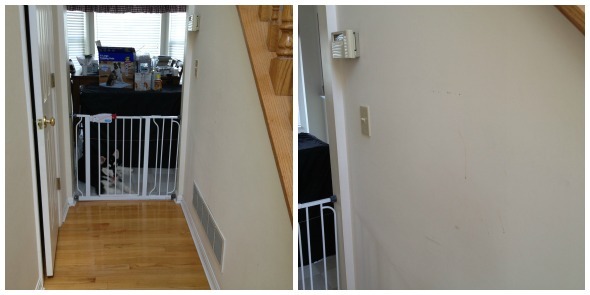 As you can see from the pictures, these wall decals are pretty easy to put up, and I think they look impressive! If you are putting up a fairly large decal, I would recommend having a second person, as the company recommends too. It really helped for us. If you would like to see a more detailed step by step of sticking the decal in place, feel free to watch the Youtube video below created by Dezign with a Z. As you will see, it really can’t be easier! I have to say I am really proud of how our wall looks now. 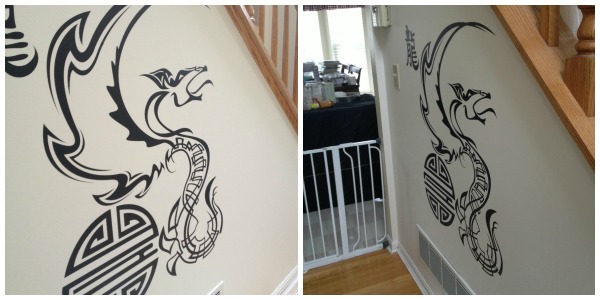 I never expect our dragon wall decal to look this good! It is one of the first things anyone sees when they walk in our front door and it really does make a statement. I still can’t believe how little effort it took to make my little DIY project happen. With how great our wall looks, I am already brainstorming my next big project and hope that if I use another decal, it looks just as good as under our stairs! Based on my experience, I have to say that I love my wall decal from Dezign with a Z. It looks amazing and was super easy to put on our wall. I really couldn’t ask for more! Best of all, it makes a statement to everyone who walks in my house! While I may not have considered putting a wall decal there in the past, I have to say that I couldn’t be happy with my Mythical Dragon wall decal and a lot of my social media friends agree! For this reason, I can happily give my wall decal from Dezign with a Z an A+ rating! So, why Dezign with a Z and not other wall decal companies? Out of all the companies online, they are modern, affordable, and have the largest selection of designs on the market that fit just about anyone’s tastes. Last year, I won a gift card to one of their competitors. They had such a sad collection of decals that I couldn’t find anything I liked, we ended up giving the gift card to a family member. I was happy to see that Dezign with a Z was different, leaving me with the tough decision of deciding which decal I wanted for my project. With a large selection of colors and even super sized decals, who wouldn’t want to redecorate their room with their artwork? Best of all, all of Dezign by Z’s wall decals are made right here in the United States! As many of you know, I love supporting American companies and keeping jobs here in the US. Even better, all of their vinyl wall designs are based on designs created by young and talented designers from both the United States and Europe. These aren’t just cheap mass produced stickers, but fun artwork that you can feature in your home, like I did in my own house! 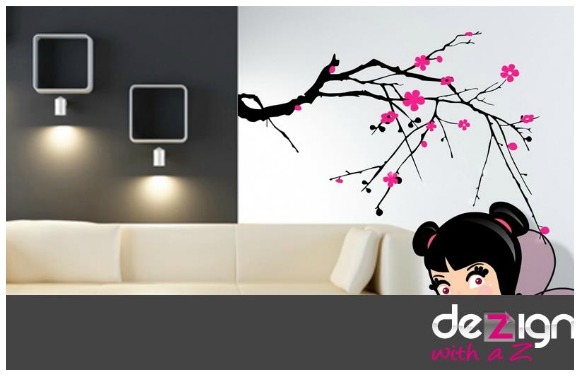 To learn more about Dezign with a Z, feel free to check out their website and see their selection of fun wall decals! Want to get a beautiful wall decal or a set of wall stickers for your own home? We are happy to announce that Dezign with a Z is working with us allow one lucky reader the chance to decorate their own wall with a $50 Gift Card to Dezign with a Z! To learn more, read the rules below and then enter through the Rafflecopter! 1 Winners will receive a $50 Dezign with a Z Gift Card. Giveaway ends July 19th at 11:59 pm EST. Sponsor is responsible for prize shipment, not Budget Earth. Disclosure: Budget Earth did not receive monetary compensation for this review and giveaway, but did receive a wall decal for review purposes from Dezign with a Z. All of the opinions on this blog are the opinions of said author and these opinions may differ from your own. I like the Custom KEy Hanger rack w/name or I would do a custom Bible verse. That looks pretty cool. I never thought to use decals before. I like it because if you change your mind, just remove it. This was a very informative & interesting review. The decals are not that expensive & if you decide you don't like it or want to change decor, they would be easy to remove. I love the Got Icecubes Penguins decal. I love penguins and it is so hard to find anything penguin. I think it would look amazing in my room. Those are cool, I have wondered about wall decals and they seem to be popular these days! I love the Even Dots wall decals for a nursery! I like the Curly Tree adhesive wall sticker! I pick up items at the goodwill and just clean them up a little.. The Spring Tree wall decal. So sorry I could not do the instagrams but I don't have a cell phone. I bought my first wall decal from another company, and then found out that the quotation was incorrectly credited. Luckily I found this out before I put up the decal, and I'm now returning it. I would recommend checking the source before you purchase any piece of art with a quotation. Would you recommend this for appartment walls? Would it be easy to remove for people who don't own a home? I like the Winter Trees…so beautiful! I had considered some of the sayings type wall decals, this dragon is great though! I like the idea of art as opposed to words, or maybe art and words!! The flying birds are really nice, but the dragons are the best – I can't decide which dragon I like more! I can't choose just one! I love the tree branches. I can't decide if I like the bare branches more or the ones with flowers… I also really like the mirrored ones. I love this idea and Dezign with a Z has some really great products!! I am moving in a week so I will have a new place to decorate and I think I really want to use a wall decal. I'm thinking maybe a tree branch or flower. I will decide once I'm all moved in. Thanks for sharing your entryway!!! Thank you so much for this post! It will help a lot when I for the 1st time, attempt to do this with my daughter in her Apt! Want to try in kids room 1st!~Was lucky enough to find all kinds of cute designs/colors & the words at Dollar Tree! Have been buying them up for awhile..now bought some colored paint/& all the other extra's needed to do this project! I need to decorate my girls’ room but the budget is tight. I am going to look into this option. Wow! How nice! This is a new idea for me and I really like it! I have to admit that I am a little intimidated with starting a wall decal project. But I have seen some Bible verse decals on etsy & I think that I will start with that. I am picking one that is small and if I can get it hung correctly, I would consider going bigger. Oooh! I wish my walls weren't textured. This looks awesome on your wall! I love these, and I think it's a great idea. I have no room for anymore furniture, so this is perfect for me! Such a neat idea. Less time consuming then paint. I did not think I would like wall decals, but my daughter's dorm rooommate helped decorate their room with the decals, and it came out really nice! That came out great and it looks really cool!! I'm impressed! looks gorgeous! I have an idea of making a mural out of multiple deacls covering an entire wall with all my fangirl favorites.